In children with glioblastoma, Heidelberg scientists have now discovered genetic alterations that affect the function of DNA packaging proteins known as histones. In a cell, histones serve as coils around which the DNA wraps. 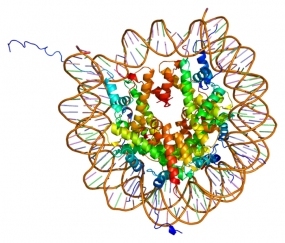 At the same time, histones regulate gene activity. Mutations in histone genes have never before been tied to a disease. The group comprising scientists of the German Cancer Research Center, Heidelberg University Hospitals and McGill University in Canada have now reported their findings in Nature. Glioblastomas grow extremely aggressively into healthy brain tissue and, moreover, are highly resistant to radiation therapy and chemotherapy. Therefore, they are regarded as the most malignant type of brain tumor. Currently available treatment methods are frequently not very effective against this type of cancer. Glioblastoma can affect people of all ages, but is less common in children than in adults. In order to gain a better understanding of the molecular processes involved in the development of such tumors and, in this way, be able to develop novel treatment approaches, an international research team has now deciphered the genetic material of 48 pediatric glioblastomas. Project leaders have been Dr. Stefan Pfister of the German Cancer Research Center (Deutsches Krebsforschungszentrum, DKFZ) in Heidelberg, Germany and Nada Jabado of McGill University in Montreal, Canada. In almost one out of two cases the team discovered genetic alterations that affect certain proteins known as histones. These are the proteins around which the DNA molecule, a thread of several feet, coils inside cells. In some cases it was the histone genes themselves that were found altered, in other cases the alterations affected the genes coding for two other proteins that assist in wrapping the DNA around the histone coils. The histone mutations are most prevalent in pediatric tumors (36 percent), while in adult glioblastoma they occur only very rarely (3 percent) and were not found at all in less aggressive brain tumors. Histones are evolutionary highly conserved proteins which are much the same in man, mouse or threadworm. 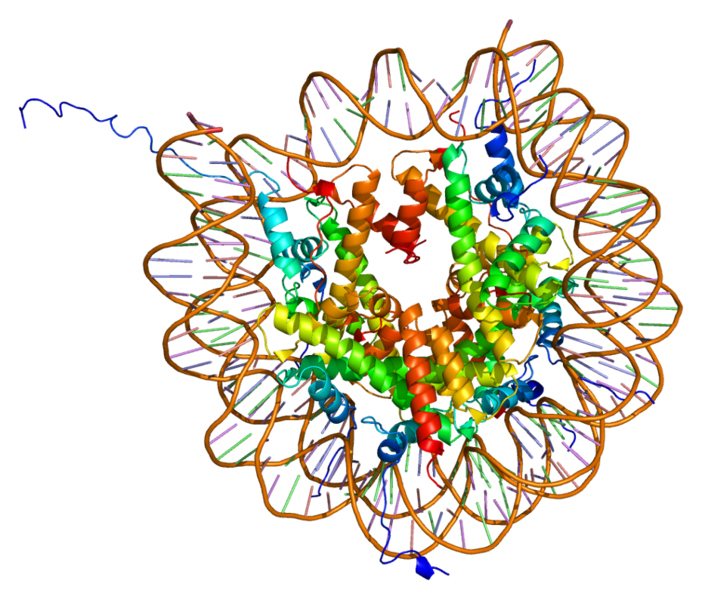 Up until recent years, histones were believed to be little more than DNA packaging material. However, by now it is known that they also determine which genes are read and which are not read; thus, they actively participate in regulating cell functions. A multitude of chemical tags at specific positions of a histone determine whether or not a gene can be accessed. A treatment approach known as epigenetic therapy, which influences the chemical tags of histones, is already being tested for the treatment of other types of cancer. The doctors and scientists of Pfister’s department will now investigate whether these drugs may also be effective against glioblastoma with histone defects. This research project was funded by the German Ministry of Education and Research (BMBF) and German Cancer Aid (Deutsche Krebshilfe e. V.) as part of the funding of the German “PedBrain Tumor” project within the International Cancer Genome Consortium (ICGC) (€15 million over a 5-year period). Jeremy Schwartzentruber*, Andrey Korshunov*, Xiao-Yang Liu*, David TW Jones, Elke Pfaff, Karine Jacob, Dominik Sturm, Adam M Fontebasso, Dong-Anh Khuong Quang, Martje Tönjes, Volker Hovestadt, Steffen Albrecht, Marcel Kool, Andre Nantel, Carolin Konermann, Anders Lindroth, Natalie Jäger, Tobias Rausch, Marina Ryzhova, Jan O. Korbel, Thomas Hielscher, Peter Hauser, Miklos Garami, Almos Klekner, Laszlo Bognar, Martin Ebinger, Martin U. Schuhmann, Wolfram Scheurlen, Arnulf Pekrun, Michael C. Frühwald, Wolfgang Roggendorf, Christoph Kramm, Matthias Dürken, Jeffrey Atkinson, Pierre Lepage, Alexandre Montpetit, Magdalena Zakrzewska, Krzystof Zakrzewski, Pawel P. Liberski, Zhifeng Dong, Peter Siegel, Andreas E. Kulozik, Marc Zapatka, Abhijit Guha, David Malkin, Jörg Felsberg, Guido Reifenberger, Andreas von Deimling, Koichi Ichimura, V. Peter Collins, Hendrik Witt, Till Milde, Olaf Witt, Cindy Zhang, Pedro Castelo-Branco, Peter Lichter, Damien Faury, Uri Tabori, Christoph Plass, Jacek Majewski, Stefan M. Pfister, Nada Jabado: Exome sequencing identifies frequent driver mutations in histone H3.3 and ATRX-DAXX in paediatric glioblastoma. The German Cancer Research Center (Deutsches Krebsforschungszentrum, DKFZ) with its more than 2,500 employees is the largest biomedical research institute in Germany. At DKFZ, more than 1,000 scientists investigate how cancer develops, identify cancer risk factors and endeavor to find new strategies to prevent people from getting cancer. They develop novel approaches to make tumor diagnosis more precise and treatment of cancer patients more successful. Jointly with Heidelberg University Hospital, DKFZ has established the National Center for Tumor Diseases (NCT) Heidelberg where promising approaches from cancer research are translated into the clinic. The staff of the Cancer Information Service (KID) offers information about the widespread disease of cancer for patients, their families, and the general public. The center is a member of the Helmholtz Association of National Research Centers. Ninety percent of its funding comes from the German Federal Ministry of Education and Research and the remaining ten percent from the State of Baden-Württemberg.